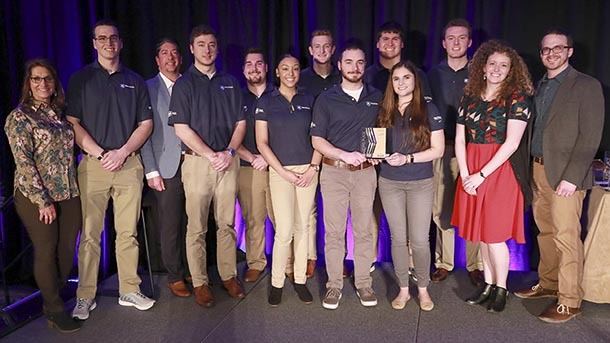 UNIVERSITY PARK, Pa. — The National Association of Home Builders (NAHB) student chapter at Penn State won second place in the Four-Year College category of the NAHB Student Competition held at the 2019 NAHB International Builders’ Show (IBS) in Las Vegas. Fifty-seven teams representing universities, community colleges, high schools and career technical schools across the U.S. participated in the annual competition. The competition challenges student teams to solve a real-life construction management problem and develop a proposal for a residential subdivision. After developing their solutions in the fall semester, teams travel and present their work to a panel of residential construction industry executive judges at IBS in the spring semester. The provided competition site was a 152-acre site in Coweta, Oklahoma. The Penn State team developed a 100-page proposal for a 290 single-family home subdivision that included six different floorplans built to meet the silver rating from the National Green Building Standard and a HERS Index score of 68 for the base package mid-line home. The proposal also included thoroughly vetted market, financial and risk analyses and a land development plan. Requiring an interdisciplinary team of students to address the various aspects, the project team consisted of students majoring in architecture, architectural engineering, civil engineering, corporate innovation and entrepreneurship, and finance. The 2018-2019 presentation team included: Lauren Lesniakowski, architectural engineering, as project manager; Drew Kreamer, architectural engineering; Justin Charles, architectural engineering; Mark DuBree, Jr., corporate innovation and entrepreneurship; David Gawryla, architectural engineering; and James Porter, finance. Additional team members included: Jonathan Gottlieb, civil engineering; Kristin Roy, architecture; and Matthew Yerk, architectural engineering. The student team was coached by staff of the Pennsylvania Housing Research Center (PHRC): Brian Wolfgang, associate director, and Chris Hine, housing and land development specialist. The PHRC is housed in the Department of Civil and Environmental Engineering and supports the residential construction program at Penn State. Penn State’s competition team has been fortunate to build on the momentum that has been built up over the past few years. Our focus on a multidisciplinary approach has not only allowed students to work with peers outside of the major but has also allowed for a well-rounded approach to the competition overall. This project asks a lot of our students but we continue to hear feedback that the hard work the students put in on this project truly helps to strengthen the foundation for their future careers,” said Wolfgang. The 2018-2019 team travel support was generously provided by the Toll Brothers IBS Travel Grant, the National Housing Endowment IBS Travel Award and the University Park Allocation Committee. Since 2006, the NAHB student chapter at Penn State has competed in the NAHB Student Competition at IBS with their previous first place wins in 2015 and 2018.